The type VII protein secretion system (T7SS) plays a critical role in the virulence of human pathogens including Mycobacterium tuberculosis and Staphylococcus aureus. 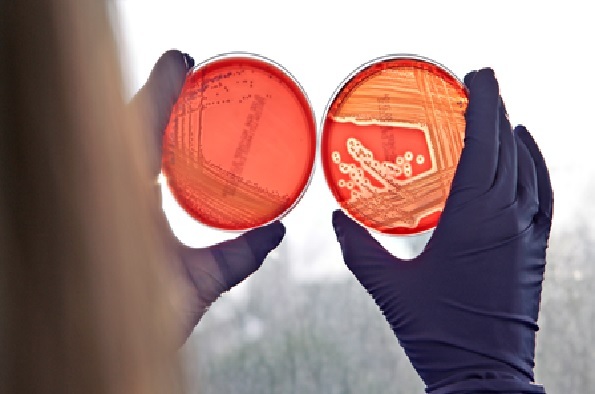 Published studies have shown that this secretion pathway plays a very significant role in the ability of S. aureus to establish persistent infections. Our overall aim is to elucidate the mechanism of protein secretion by the S. aureus T7SS machinery and to identify secreted substrate proteins. Recently we have shown that some strains of S. aureus secrete a large nuclease toxin, EsaD, by this pathway. The toxic activity of EsaD is neutralised during its biosynthesis through complex formation with an antitoxin, EsaG, which binds to its C-terminal nuclease domain. Secretion of EsaD is dependent upon a further accessory protein, EsaE, that probably targets the EsaDG complex to the secretion apparatus. We have shown that EsaD exhibit significant antibacterial killing activity against a sensitive strain and most likely plays a role in colonisation. Very recently we have identified a further secreted substrate of the T7SS that appears to be partially responsible for the virulence phenotype of the T7SS in an animal model of infection. Thus this secretion system has anti-bacterial and anti-eukaryotic targets.